The World Looks Red: Why are you so skinny? This is gonna be a long post about an issue I've been meaning to address for quite a long time. A large part of the questions I get are about why I'm so skinny, how I stay skinny, what I eat, what diets I recommend etc. What I do to stay skinny? I'm sorry to say this, but not much at all. Actually, as an avid fastfood and pizza lover, I'm surprised I'm not twice as big. I've always had a fast metabolism and everyone in my family is just naturally skinny. Unfortunately not everyone is blessed with this and I realize how lucky I am, but I and other bloggers like me have been getting a lot of comments about our weight and lots of questions about eating disorders. Apparently a lot of my photos have appeared on pro-ana blogs and I just wanted to say that I am not okay with that, I do not support or promote that kind of lifestyle at all. For everyone who genuinely want to know about health and recipes etc: I can give you some tips on how to get to get healthier without going diet-crazy. These are simple basic things that I try to live by, although I have the luxury to ignore these rules sometimes. 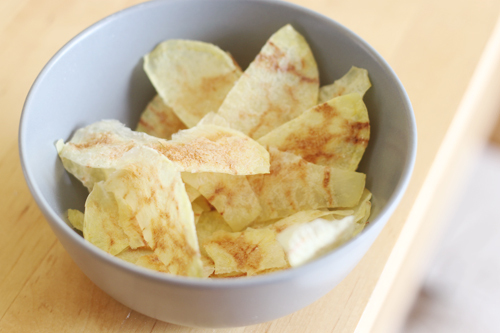 I'll start with an awesome recipe for something everyone can enjoy: crisps. These ones have no fat at all, they're gorgeous and crispy and delicious, super fast and easy to make. 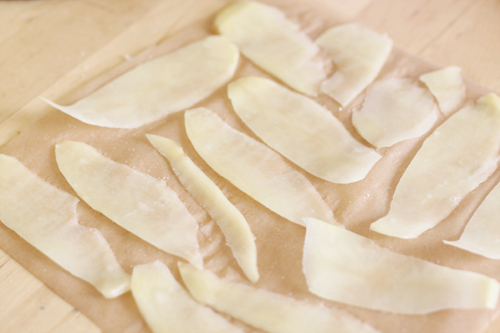 With a potato-peeler (or cucumber-slicer or whatever you like to call it), cut really thin slices of potato. Put them on a sheet of baking paper that'll fit into your microwave. Make sure they're not overlapping, or else they won't be crispy! You can add any seasoning you like, anywhere from salt, pepper, chili-, curry-, paprika-powder and so on. You can even dip them in vinegar! You don't want to put too much salt on 'em though, cause that'll take it back to being really bad for you. They should look like this when they go in. Put the sheet of baking paper onto the glass plate of your microwave. I set my microwave at the highest setting for 2,5 minutes. Then I open the microwave for a couple of seconds to let the steam out and then they go for another minute. You're gonna want to experiment with the settings of your microwave a bit to find out what's perfect for yours. You're waiting for them to turn a bit brown in places. Let them cool for a while and then you can put them in a bowl. Leave the door of the microwave open while preparing your next batch to let the steam out. How beautiful is that? This bowl has about two batches. I never thought a microwave could make such gorgeous healthy snacks. -Never skip meals, especially not breakfast. Eat something small every couple of hours to keep your metabolism going. -Lower your portions. I eat all the things I like, including fries, pizza, burgers etc, but I generally try to keep my portions small. A great tip for lowering your portions is to buy smaller plates, bowls, pans. That way you won't have that much empty space on your plate. Also cook less so you're not tempted to go for that second serving. If you want to have some crisps or ice cream at night, put a serving in a bowl. Don't eat out of the bag, cause you and I both know it'll be gone before you know it. -Slow down. Chewing your food well will make it easier to digest. You'll also see that you're less likely to overeat. -Eat plenty of fruit and veg. It's almost too obvious, but I thought I'd mention it anyway. I tend to buy fresh vegetables, but it's a good idea to always keep some frozen veggies in the freezer! -Quit soda, drink lots of water. Soda = poison. It's such a bad thing to put into your body. For me this is quite an easy one, 'cause I've never been a fan of soda. But I agree, tap water is one of the most boring things to drink. That's why I buy sparkling water! It still has that nice fizz that'll make it feel like soda, but there are no calories, no sugars, no sweeteners, no artificial flavors. It might take a while to get used to, though, so you might want to add some flavor by throwing in a slice of lemon or a couple of mint-leaves. This'll also be good for your wallet, cause over here you pay about four times as much for a bottle of Coke than for a bottle of sparkling water. Winning! -Work it. If working out/going to the gym is a big step for you (it certainly is for me), then see where you can sneak exercise into your daily routine. Get a bike, cycle to school or work, walk more, go dancing! Every bit helps. -Consider vegetarian options. I think a lot of people still see vegetarianism so black and white. A popular misconception is that you have to be either a 100% vegetarian (the kind with armpithair and a deep hatred and judgement for everyone who does eat meat), or not you're vegetarian at all. That is such a 1970's state of mind. I eat mostly vegetarian and often vegan food, but I'll have a Whopper if want one, I'll take salami on my pizza and I love a good barbecue. But most of the time I eat meat replacements. Vegetarian alternatives are really yummy, really healthy and -not unimportantly- a lot cheaper. I think people could benefit a lot by eating a bit less meat. No one likes an evangelical vegetarian, but if you're into the subject, read Eating Animals by Jonathan Safran Foer. It really put me off meat for a while and I was shocked by the effect the meat industry has on the environment. I buy the best quality meat whenever I can. People have been asking me about yummy vegetarian recipes and I'll think about sharing some on this blog from time to time for inspiration. -Don't set a goal weight and don't diet. I don't mean to sound like Dr Phil on this one, but it's unavoidable. Don't say: I'm gonna try this diet until I weigh so-and-so many kilo's. Going on a diet will make you feel like you're depriving yourself of something, and as soon as you reach that goal (or as soon as you notice the diet's not working for you) you'll probably fall back into your old habits quite quickly, resulting in the famous yoyo dieting. Instead tell yourself you're going to change your lifestyle. It can only take small changes like the ones listed above to make a big difference in the way you eat. If you're seriously worried about your health, you should consider seeing a dietician. i try to eat healthy as well but i lack serious exercise haha! thanks for the tips and recipe! Great post! I've always been very skinny and am an incredibly picky eater when it comes to healthy food (I dont discriminate when it comes to junk food) but when I pick at dinners and often leave a lot behind on my plate I can see people adding two and two together and getting twenty so I know how frustrating it is. I love the healthy crisp recipe too - I'll definitely be giving it a go. I'm naturally skinny, too, and I get upset when some people think I'm starving myself. Being skinny has a lot to do with genetics as you said. I'm also naturally skinny, and also many people think I eat not enough !, hate that!! And that about selfmade chips!,have to try that!, looks delicious! have just tried the crisp recipe with some smoked paprika...delicious. You have changed my snacking ways as crisps are my downfall. Love this post! I´m gonna try this potato recipe today, wish me luck! aww this is a great post, so lucky to be naturally thin! wow, nice thinking, and especially, nice advising. i'm totally for a non-diet and less-eating lifestyle. totally good to cut a bit on sweets, soda, and too much fat...it works i promise! Sorry to hear your content was abused like that. Ah, ik vind dit echt cool trouwens. Ik denk dat dit soort dingen mensen over het algemeen wat meer aanspoort om serieus met hun gezondheid om te gaan ipv zware regimes met ranzige smoothie-achtige verhalen. seriously... some people are just natural born skinnies and i totally understand. and this is quite funny because the other day i was just thinking about making my own potato chips. and i very much agree... no crazy diets! i don't hold out on any type of food. i still love my corn dogs, pizza & french fries... i just portion myself.. i just always tell ppl b/c they think i'm "skinny" which my thunder thighs don't lie... i am not.. just tell 'em... my diet is "portion, portion, portion." i've cut back on pop. my family is total pop-o-holics!! i have a cup once a week... in hot weather, i could careless. 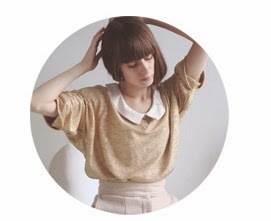 Your tips are great and attainable! You also look very healthy. Thank you for sharing this. 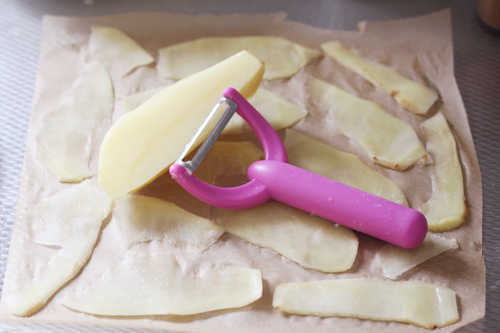 Je aardappelsnack-tip is een goede, snel eens uitproberen! By smaller portions you mean the size of your palm. I think that's what messes a lot of people up. They can't eat 6 oreos; they eat the whole damn bag. This makes me so happy to read, very refreshing and real. I wish your healthy outlook and advice made a few more appearences in the mainstream media. Thank you. 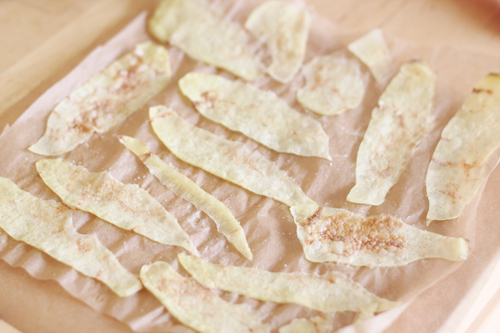 This recipe for making you own crisps is great! My boyfriend has been experiencing with making his own too and I am definitely going to tell him about this.